We are soooo ready for Spring! Aren't you? So tired of the Nashville weather not being able to make up it's mind!! So I decided that if I wanted to be pulled out of these winter blues- I'd need a fresh and fun mani! 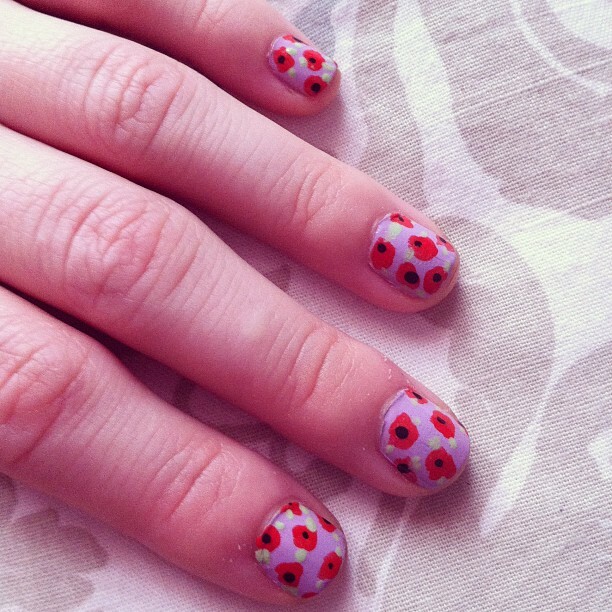 Here's what I did to create these fun Pastel and Poppy Flower Nails! The best way to create these nails is to do one nail at a time. First you need to paint the background color of your nail. I used Essie's 'Nice is Nice,' which is a pastel purple. While the background color is still wet, paint on the poppy flowers. (I used N.Y.C. polish in 'Times Square Tangerine Creme' for the flowers.) To do this all you really need to do is create a floral-shaped blob of nail polish. I started by creating a really fat "X" shape with the polish brush and then painted it into a more circular shape. Take a pencil dipped in a pale green polish (I used Avon's 'Green with Envy') and add 2 dots on either side of each flower. These should only show up just enough create interest so it's best not to use a darker green color. Finish with a clear top coat- I used Essie's 'No Chips Ahead.' Then you are finished! 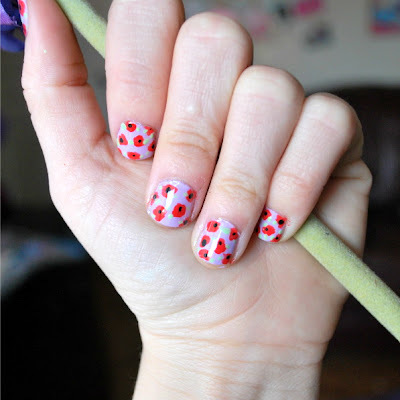 You could create these nails in pretty much any color you wanted but since poppy flowers were my inspiration, I decided to use a color similar to their true color! If you enjoy our blog, please do follow us! All the different ways you can follow us are listed at the top of our blog on the left side! love these nails. how do you take your pics? Do you have someone else taking them for you?